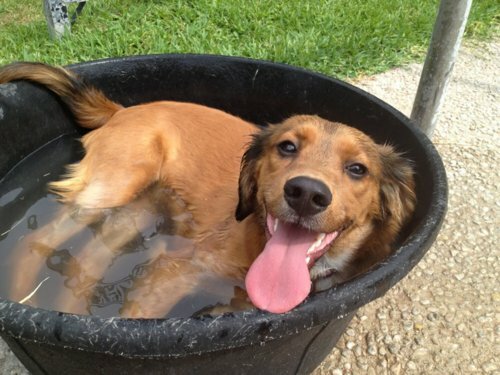 It’s gonna get hot soon and your dog or cat might start looking for those cold spots in the hot to hang out like the tub, tiled floors, and right in front of the a/c. Hot weather can be dangerous for pets. If you are wondering how to make sure your furry friend can stay cool, try the following things. For pets that come in from playing outside, give them a frozen treat like a chew toy that has been in the freezer. A kong toy stuffed with peanut butter that is frozen is great and will keep your dog occupied after a romp out in the sun. Dogs will lick it, chew on it, and cool off their body quickly. You can also give your dog a frozen jerky treat. Your dog stay cool. Never leave your dog in a car while you run into the store. Even if you had the a/c cranking, don’t do it. A car heats up in a matter of minutes and becomes an oven. It’s estimated in about 10 minutes a car’s temperature can rise 30 degrees. In some states, you may also be fined if the police are called. Cracking a window is not enough. If you have chores to run, leave your pup home. Go for walks in the early mornings or later in the evenings when the pavement isn’t as hot. Your dog’s paws can get burned walking on cement that has been in the sun for hours. If you think it might be too hot for your dog, don’t go out. Their paws can blister and be incredibly painful. If you have an indoor/outdoor cat, keep her/him inside too during the hottest parts of the day. During really hot and humid day make sure there’s fresh, cold water available for your pet all day. Dogs and cats release heat through their paws, panting, and ears. When leaving them home, toss a few ice cubes into their water bowl. You can also wipe their paws with a cold towel to help cool them off. They might wonder what you’re up to but will thank you after you’re done.